Hey guys, here’s some new foes for secret areas! I’m really happy with how these turned out. 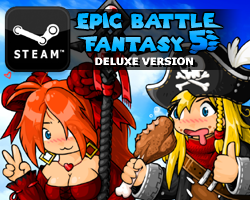 I actually made these a day or two before EBF5 launched on Steam, and have been keeping them secret for a while. If you can’t view Flash files, the YouTube version is here. I’ll be announcing a new foe competition soon! 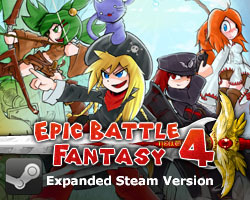 This entry was posted in Epic Battle Fantasy 5 on February 8, 2019 by Matt Roszak. Yeah, that happens if you have less than 5 party members. I’ll need to fix it. The skill should work fine once your party is full. A new foe competition ?! Nice !